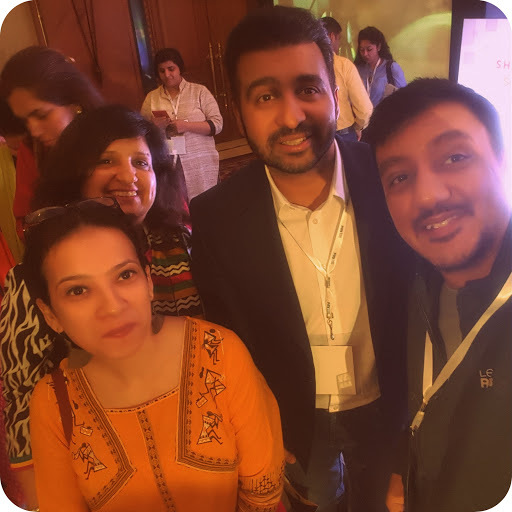 I attended the SHEROES Summit last year as a blogger and walked out of the venue as a changed person. Suffice to say, SHEROES is redesigning work for countless women across our country by creating a career ecosystem that spans across who you are. It is perhaps the only organization in the world at the moment that works with other organizations to build newer models of work for women. None of this could have happened without progressive ideas. 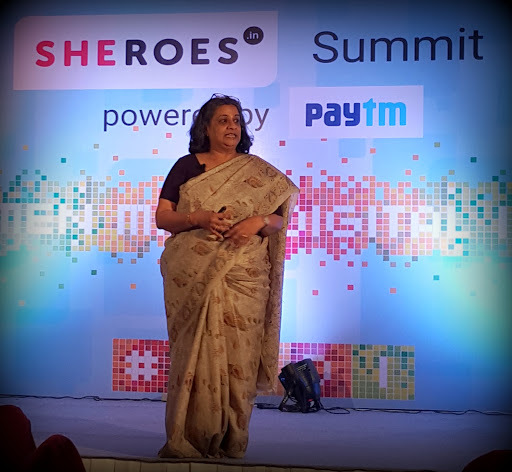 This year SHEROES returned on a bigger, better canvas endorsing the theme of "Women Make Digital India". The summit was held on November 18, 2015 at the Eros Hotel in Delhi and received sponsorship from the likes of Paytm, Best Deal TV, Nischint Technologies, Kaaryah, and Furlenco. Event partners included CNBC, Youth Ki Awaaz, Utpatang, and Giftxoxo. 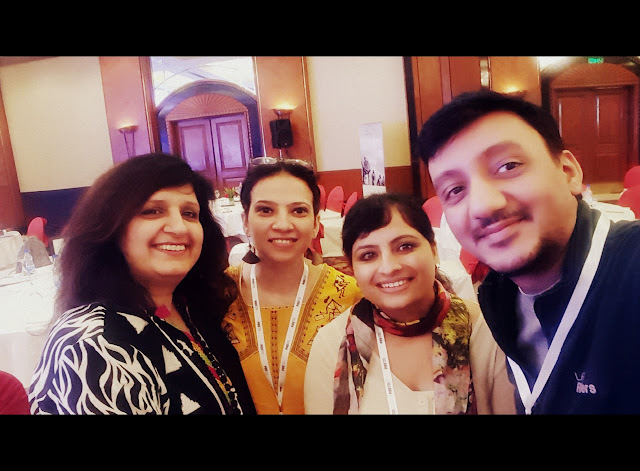 Post registration, I was handed over the media kit and escorted to the front row, where I was introduced to other bloggers, Rupali Bajpai, Sulekha Rawat, and Arti Pathela. 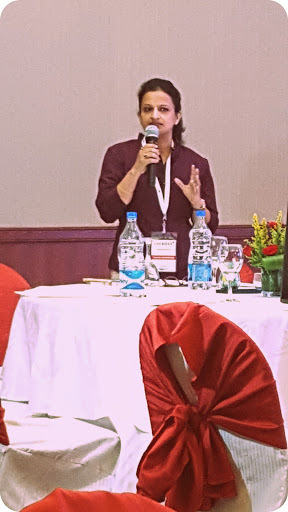 Sairee Chahal, who is the Founder, CEO at SHEROES, then provided a brief introduction about her company, Applied Life Pvt. Ltd.
SHEROES connects businesses with female talent, creating an eco-system of opportunities, mentorship employment formats and community. The theme for this year's summit centered on the role of digital empowerment for women. What we as a country have missed out in the last decade or so, we are making up for it through entrepreneurship. Currently India has the most number of entrepreneurs. Thanks to digital/social, formats are becoming irrelevant. Clues are hidden here and there; it is your job to go find them. 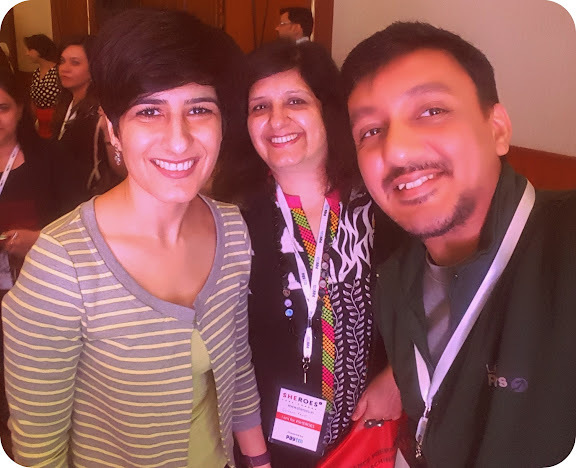 Sairee then handed over the mic to Archana Arora, who is a partner at Simply Digital India. 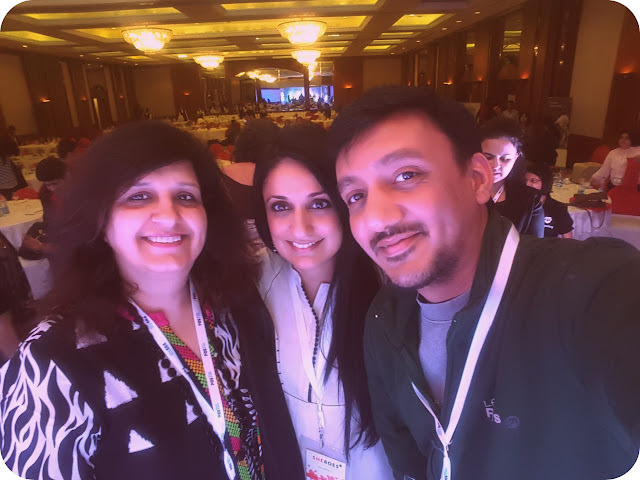 Post maternity, Archana took a sabbatical but ultimately had to sacrifice a flourishing career in brand marketing to start a digital marketing course. Her entrepreneurial journey started last year, soon after attending the SHEROES Summit 2014. Archana's transformation is NOT the stuff dreams are made up of. She had to reskill in order to understand every pillar of Digital Marketing and now shares her digital knowledge on SEO, Google Analytics, PPC Advertising and Google Adwords, Social Media Marketing, Mobile Marketing, e-commerce Marketing, Affiliate Marketing, Email Marketing, Online Display Advertising, and AdSense. 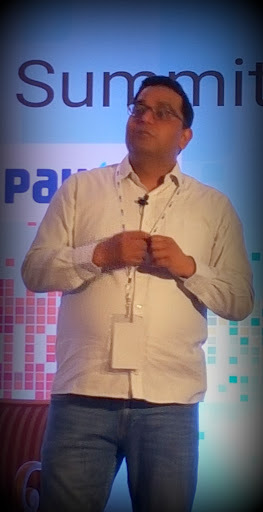 The keynote address was given by none other than Vijay Shekhar Sharma, Founder and CEO of Paytm, which is one of India's fastest growing mobile Internet and mobile commerce company. Vijay invests in early stage mobile Internet startups through his company's One97 Mobility Fund. India witnessed its last euphoria around 1998-99, when the Internet arrived in our country for the first time. With 1 billion smartphone users in India alone, Internet will soon become accessible to all. Companies like Paytm, Uber, Flipkart and Snapdeal see this as a huge business opportunity. Tech is crossing multiple industries. Both digital and social are great enablers. For Paytm, it was important to know that 200 million people in India had bank accounts. Those were potential customers who could benefit from digital wallet. India's middle class has finally arrived. They are young and tech savvy. Men work for three things: money, title, and job security. Women also work for the same things but in reverse order. Satisfaction of work and acknowledgement are extremely important factors in today's work environment. Go back to what you always wanted to do. India should take a leaf from China that has two-thirds of the world's self-made female billionaires. Customer's prosperity always matter. Always cater to customers who are rich first. What you've achieved in life is directly proportional to what size of the problem you have or you're dealing with. Get a high-value customer (a.k.a. alpha customer) who drives the customer behavior. Always build businesses that you're a customer of. You're part of a crowd. Entrepreneurs see the world through the eyes of a customer. You are what your situations make you. On the audience question of whether to go for seed funding or angel funding: Every category has an investor. Believed in 'cashback' instead of 'discounts and loyalty schemes'. The tea break provided yet another opportunity to network and exchange business cards. Post tea break, Sairee introduced us to an esteemed panel who debated on the Opportunities and Trends with focus on the theme of "Women Make Digital India". The session was moderated by Amrita Tripathi, Writer and Senior Journalist. Amrita has penned two novels 'The Sibius Knot' and 'Broken News' that deal with the darker side of urban realities, including abuse, harassment, and fragile mental health. She is a co-curator on the crowd-sourced twitter handle @genderlogindia which features a different guest each week, tweeting about gender rights, identity and equality in different contexts. Raj is a serial entrepreneur, writer, and sports enthusiast. Married to popular Bollywood actress, Shilpa Shetty, Raj is the man behind the vision of 'Direct Channel Agent Women Empowerment' initiative. He believes that for change to happen in the society, one has to start at home. The TV commerce market is slated to grow in India, and women have a great role to play in this growth. Between now and March 2016, Raj plans to hire 5000 women to handle the operations of Best Deal TV. TV can sell anything. TV commerce is about the right demonstration. Celebrity led endorsement is far more credible. An actor will never associate to a brand/product he doesn't believe in. 90% of our business is Cash on Delivery (CoD). In the next seven months, exclusive products will be available to agents who sign up with Best Deal TV. Every new business is trying to become disruptive; that's the new flavor of air. A Cancer survivor, Kanika Tekriwal is the CEO and Co-founder of JetSetGo, a New Delhi based startup that aggregates private jets, much like Uber does with cabs. You can either convince on value or price but rarely both. Design and development go hand in hand. Jasminder Singh Gulati is the Co-founder and CEO of NowFloats, a company that enables small businesses to get online and get discovered through frictionless mobile technology. In just three text messages, get a website done for your business. Start driving content to your site in the fourth SMS you send. Fishermen in Karwar, a Tier 5 city in the South Indian state of Karnataka, use WhatsApp on their phones to send photos of fishes captured by them to nearby restaurants. Smita Mishra is the Founder of PoolWallet, a micro payment platform that also allows online expense sharing. She engages with different forums to assist growth for women in her field and otherwise too. Deserving ladies in India not getting the right opportunities. When you reach the next level in your career, help those in your periphery to scale. Digitization of services is the right kind of empowerment. Example: UrbanClap, a one-stop destination for all urban lifestyle services. Contrary to popular belief, do not start with an idea. At the core of your entrepreneurial journey lies a problem that you're trying to solve for your customers. Audience for PoolWallet might be literate but not digitally literate. On the audience question of what comes first - design or development, Smita said "Need people with whom you can bounce your ideas. Don't outsource the core." Once the panel discussion ended, everyone was requested to head for lunch. 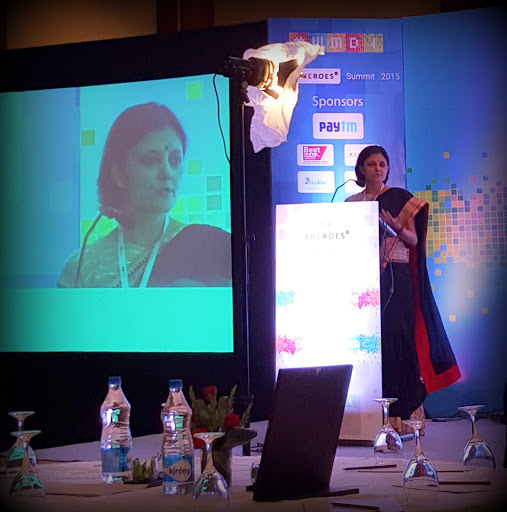 Post lunch came the best session of the summit by Sangeeta Murthi Sahgal. Sangeeta is a consultant coach and a caregiver, with over 30 years of experience across functions like HR, Training, Operations, and P&L Management. She spoke about her transformation from corporate personnel to a professional caregiver. Her father, K V S Murthi, was diagnosed with Parkinson's disease in 2008. He now also has mild Dementia and Diplopia. Sangeeta's presentation was aptly titled "Circumstances and Choices". She spoke about circumstances one does not have any control on. You must possess the courage to face the consequences of the choices you make. Taught by nuns, you're scared of none. Calls herself a 'corporate creature'. Had to choose between "I will work till the day I die" versus "I want to retire in 5 years". It is not about a working day; it is about 'working the day'. Taking time off is critical. Time to heal is more important than promotions and pay hikes. Roll with punches and ride with the wind. If you want to make God laugh, share your plans with him. When you have parents with degenerative diseases, you're burning the candles at both the ends. Understand and adapt, but "I" have to come first. Have fun every day as often as you can. There is only one life to live. Life is not about how to survive the storm but how to dance in the rain. Sangeeta's session left everyone in the audience teary-eyed, but it wasn't long before Neeti Palta brought the house down with her stand-up comedy act. Neeti is one of the few female English stand-up comediennes in the country. She was ranked Number 1 on CNN IBN's list of 'Top 20 Indian stand-up comedians to watch out for' in 2014. Her comic style can be best described as 'cuttingly sarcastic' and 'irrepressibly tongue-in-cheek'. Live life like someone's left the gate open. What is the difference between a male and female comedian? Maybe we look better in shorts. Are you letting your inner voice affect you? Even today people see stand-up comedy as an 'unusual' career choice. "To be able to sing, you have to have lived," said Sonam Kalra who summed up the day on a musical high. Sonam is an award winning singer who is trained in both Indian and Western traditions of music. Her unique brainchild 'The Sufi Gospel Project' blends the many voices of faith, through poetry, prayer and music. As long as there is truth in the moment, there will be beauty. People with passion live the most glorious lives. 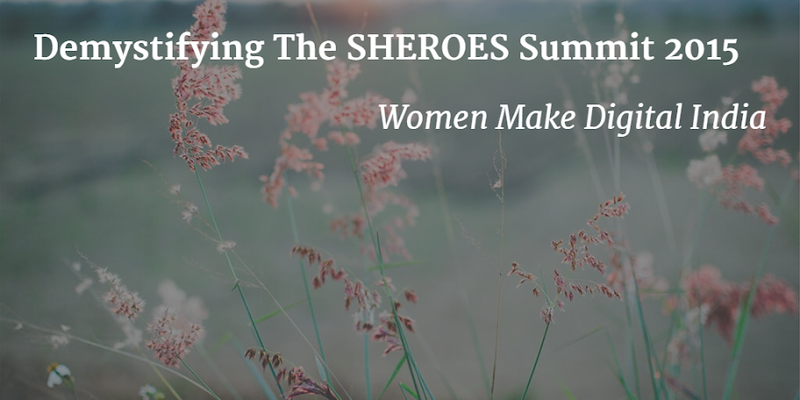 The SHEROES Summit 2015 was a massive success with 9 speakers, 403 attendees, and 1150+ tweets. I so look forward to the next edition now, and hope that it reaches out to every woman in India with a career question on her mind.